G.P. Putnam's Sons Books for Young Readers, 9780525517795, 40pp. 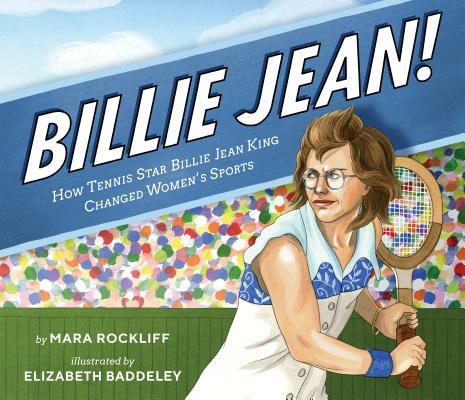 A fun and inspiring picture book biography of tennis legend and women's rights activist Billie Jean King. From award-winning author Mara Rockliff and New York Times-bestselling illustrator Elizabeth Baddeley comes this extraordinary picture book about one little girl who loved sports and grew up to be one of the greatest and best-known tennis players of all time. Anything Billie Jean did, she did it ALL THE WAY. When she ran, she ran fast. When she played, she played hard. As a top women's tennis player, Billie Jean fought for fairness in women's sports, and when she faced off against Bobby Riggs in the Battle of the Sexes, the most famous tennis match in history, she showed the world that men and women--and boys and girls--are equal on and off the court. Mara Rockliff is the author of many lively historical books for children, including Mesmerized: How Ben Franklin Solved a Mystery that Baffled All of France, winner of the Cook Prize and an Orbis Pictus Honor Book; Gingerbread for Liberty! How a German Baker Helped Win the American Revolution; Around America to Win the Vote: Two Suffragists, a Kitten, and 10,000 Miles; and Anything But Ordinary Addie: The True Story of Adelaide Herrmann Queen of Magic. Learn more at mararockliff.com or on Twitter @mararockliff. Elizabeth Baddeley is the New York Times-bestselling illustrator of I Dissent: Ruth Bader Ginsburg Makes Her Mark by Debbie Levy, which won the Sydney Taylor Book Award and the National Jewish Book Award and was named an Orbis Pictus Award Honor Book. She has also illustrated An Inconvenient Alphabet: Ben Franklin & Noah Webster's Spelling Revolution by Beth Anderson, The Cat Who Lived with Anne Frank by David Lee Miller and Steven Jay Rubin, and The Good Fight: The Feuds of the Founding Fathers (and How They Shaped the Nation) by Anne Quirk. Learn more at ebaddeley.com or on Twitter @BizBeth.